It appears that since the fall of mankind, the favor of God has to be obtained. 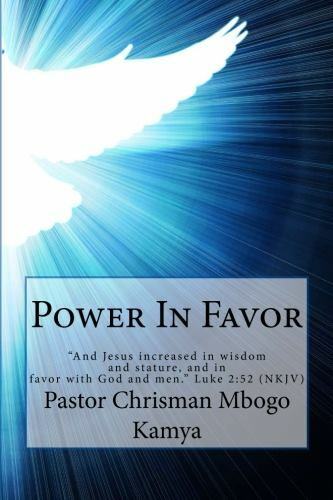 In this easy to read and captivating book “Power In Favor” it spells out step by step how to get the favor of God and how that can transform your life. Whenever we ask the LORD questions, He always answers us. The answer is “Yes,” “No,” or “Not Now.” After putting into practice the principles you will learn through the revelations given in this marvelous work. You will soon come to realize that the ultimate “Yes” is when we ask for and get the favor of God. In collaboration between Pastor Chrisman Mbogo Kamya of the “Nations Gatherers Christian Church” and “We All Are One Ministry, Inc.” this work came together with a flow that will be cherished by you and all. It’s full of unforgettable tools to live your Christian walk with more pleasure and less pressure. It’s not too late and you are never too lost. Favor makes hard, easy!